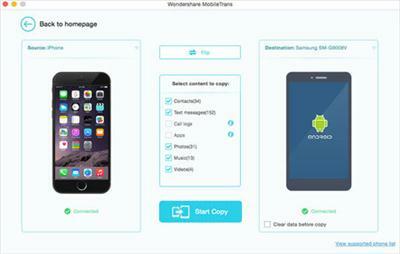 Wondershare MobileTrans for Mac Transfer content between iPhone & Android- in just one-click! The Quick and Easy way to Transfer content between iPhone & Android on Mac. Make moving to your new device an easy transition with Wondershare MobileTrans for Mac (fully compatible with Android 5.0 LollipopNew icon, iOS 8.1). You can transfer over all of your data - including contacts, text messages, call logs, photos, music, videos and apps - with no risk or loss of quality. Whether you're upgrading phones, switching to a different device or changing carriers, your content needs to move with you. In just 3 simple steps, MobileTrans for Mac can transfer all of your content to your new device. Move all compatible files between different types of phones and carriers. Don't just transfer names and numbers; also transfer job title, email address, company name, and more! Ditch your old BlackBerry phone, but don't want to leave anything behind? Don't worry. This tool makes it super easy to extract backups made by BlackBerry Desktop Suite and transfer contacts, SMS, etc. to Android phone or iDevice. Selling, donating or recycling your old Android device, iPhone, iPad or iPod touch? Deletion or factory reset is simply not enough to secure your personal data. Some recovery tool easily gets them back. Worry about it? You don't have to. Wondershare MobileTrans for Mac makes it a permanent deletion effortlessly. It helps to scan and permanently erase all existing data and all deleted data which still stays in the phone memory. Nothing is recoverable.